Based on the latest UN figures, the report estimates 60 million people will be affected by El Niño this year, with many of them suffering health consequences. The World Health Organization has produced a report on the 2016 public health consequences of El Niño, the weather effect that is a warming of the central to eastern tropical Pacific Ocean. It affects rainfall patterns and temperatures in many parts of the world, most intensely in the tropical regions of Africa, Asia-Pacific, and Latin America. Based on the latest UN figures, the report estimates 60 million people will be affected by El Niño this year, with many of them suffering health consequences. "From Ethiopia to Haiti to Papua New Guinea, we are seeing the damage from El Niño, and we believe the impact on public health is likely to continue throughout 2016 even after El Niño winds [lessen]," said Dr. Richard Brennan, director of WHO's Emergency Risk Management & Humanitarian Response Department. "To prevent unnecessary deaths and illnesses, governments must invest now in strengthening their preparedness and response efforts." 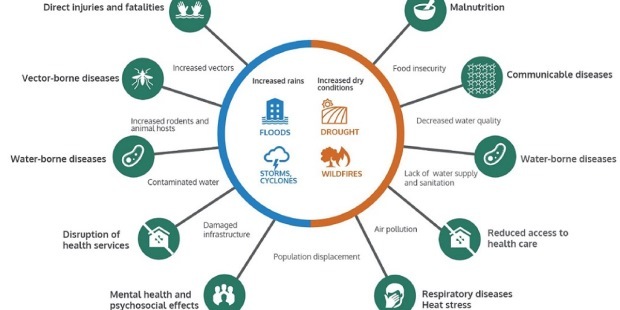 The report predicts the drought, flooding, heavy rains, and temperature rises that are known effects of El Niño may lead to food insecurity and malnutrition, disease outbreaks, acute water shortages, and disrupted health services. Health problems usually are more intense in developing countries with fewer capacities to reduce the health consequences, according to WHO. The El Niño taking place from 2015 to 2016 is predicted to be the worst in recent years and comparable to that of 1997-1998, which had major health consequences worldwide. "In Eastern Africa, as a result of the El Niño in 1997-1998, WHO found that rainfall patterns were unusually heavy and led to serious flooding and major outbreaks of malaria, cholera and Rift Valley Fever," the agency reported, adding that the adverse health effects of El Niño are expected to peak in January 2016 and wind down by April, but health impacts will last throughout 2016. El Niño is already causing heavy rains and flooding in Eastern Africa with an associated risk that a recent cholera epidemic of more than 12,000 reported cases in Tanzania will spread; the Tanzanian cholera outbreak is the largest since 1997-1998, which had more than 40,000 reported cases. Drought in the Horn of Africa has affected 22 million people and been followed by unusually heavy rains with a higher risk of vector borne-disease such as malaria and outbreaks of other communicable diseases including measles and cholera. Extreme drought and acute water shortages are affecting millions of people in the south western Pacific, Central America, and southern Africa, and this will result in increased malnutrition and diarrheal diseases. Severe flooding in Paraguay in December 2015 forced the evacuation of more than 100,000 people, while wetter conditions in South America are expected to cause intense flooding in Peru, Ecuador, and Bolivia with increased incidence of vector-borne diseases, respiratory infections, and damage to health facilities with impacts well into 2016. "It could take years to recover without an adequate, efficient, and timely preparedness and response to El Niño," Brennan said. The report suggests taking these steps to prevent and reduce the health effects of El Niño, including: disease surveillance; controlling the transmission of diseases (e.g. vaccinations) and the vectors that spread diseases; mobilizing communities to promote health and hygiene practices; improving water and sanitation services; strengthening logistics and medical supply chains; providing emergency medical care and maintaining access to health services; and effective coordination of preparedness and response measures.